Do you know about Nanbu-hishizashi featuring a similar appearance to Koginzazhi but with different elements? To be honest, I have learned the stitch several months ago. In 1932, Nanbu-hishizashi was introduced with Koginzashi in “Kougei” No.14, a bulletin of the Mingei Movement, which contributed to raise Koginzashi’s publicity nationwide. 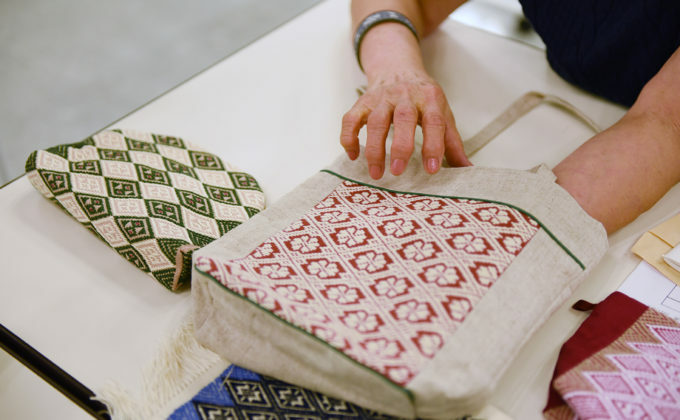 In which, Muneyohi Yanagi commented: “ I have never seen such a colourful locally-produced embroidery in Japan. If I did not know about that, I would think that it is from Scandinavia.” The literature for Nanbu-hishizasi are scarce, compared to Koginzashi, so that this section is just a half of the Koginzashi section. After the publication of “ Kougei” No.14, Koginzashi’ had gradually became known in accordance with its strenuous promotion, while Nanbu-hishizashi had struggled to get momentum for its fame. Therefore, even today, many people may still confuse Manbu-hishizashi and Koginzashi. There are fewer classrooms for Nambu-hishizashi in Japan. In the suburbs of Tokyo, some culture schools are available. I visited one of the schools and met the Nanbu-hishizashi group, who holds a monthly class at Chofu city in Tokyo. 10 years ago, Ms Kimiko Nagaoka, who is a member of the Chofu Kougei Bijutsu Association, fell in love with a Kimono obi (the belt used for kimono) displayed in a women’s magazine, which inspired her to study Nanbu-hishizashi. She learned independently, using a library to obtain the information that is hard to get. Not only for that, she has also visited Hachinohe city in Aomori prefecture, the birthplace of Nanbu-hishizashi. Ms Nagaoka, who was born and raised in Tokyo, has had no relationship with the city, but she went there many times for her study. Meanwhile, she met a teacher running a class in the outskirts of Tokyo. Seven years ago, the teacher encouraged her to open her class, which brought her top open her first classroom at home. In 2013, she rented the current space to open a second classroom, where many students have learned today. It is a public open space, in which various groups enjoy a wide range of activities. Her class, the Nanbu-hishizashi group, gets together on the third Monday of each month. The space is for everybody, so that you can see students and talk to Ms Nagaoka. Students join the class between 10:30 and 16:30 at their conveniences. Ms Nagaoka’s tag, “Nambu-hishizashi koubou” is attached to each completed work. As the first step, students practise the Nanbu-hishizashi with a small square cloth whose side is 20cm in length. After that, they can make what they want, discussing with Ms Nagaoka. 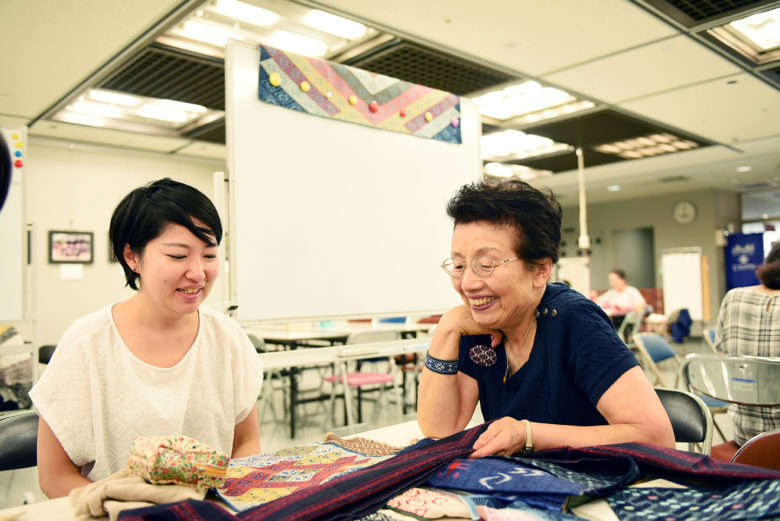 The majority of her students are the posh elderly or middle-aged with some experience in sewing or knitting. When I visited, they were making large items, such as pouches, bags and table centres. During a summer holiday, their children sometimes participate in her class. Ms Nagaoka advises each student according to individual skill level. Also, the group members help each other. This friendly atmosphere enables novice students to start comfortably. Ms Nagaoka is happy to help finish up the items in the case that students cannot complete. After that, the students’ works are displayed in exhibitions hosted by the Chofu Artwork Association or in the Chofu City Culture Festival. With considerable passion for learning, some students living farther from the school come all the way to her class. 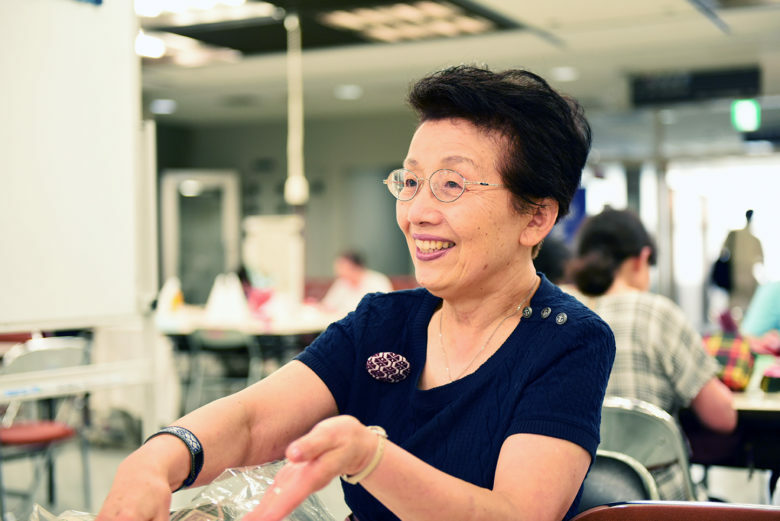 Ms Nagaoka said: “ For such passionate students, what ever happens, I am punctual and stay between 10:30 and 16:30 on every 3rd Monday.” Before renting the classroom, Ms Nagaoka had wanted to increase the hishizashi’s publicity and create a place where people can exchange information on that. Her student is due to make an apron as the first product. Ms Umesawa, who introduced us to Ms Nagaoka, is one of her students. Today’s class was the first lesson after her long-time maternity leave. 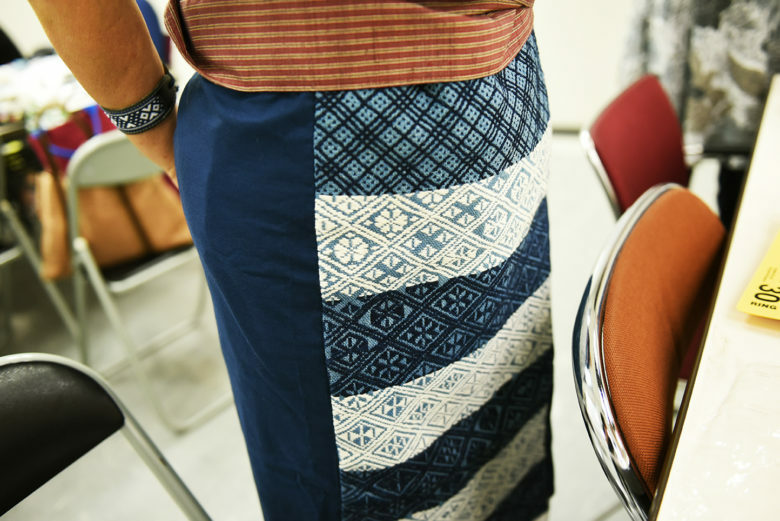 During the lesson, Ms Nagaoka and Ms Umesawa looked very cheerful, matching Umesawa’s apron with an antique kimono cloth Nagaoka bought for the waistband of the apron. 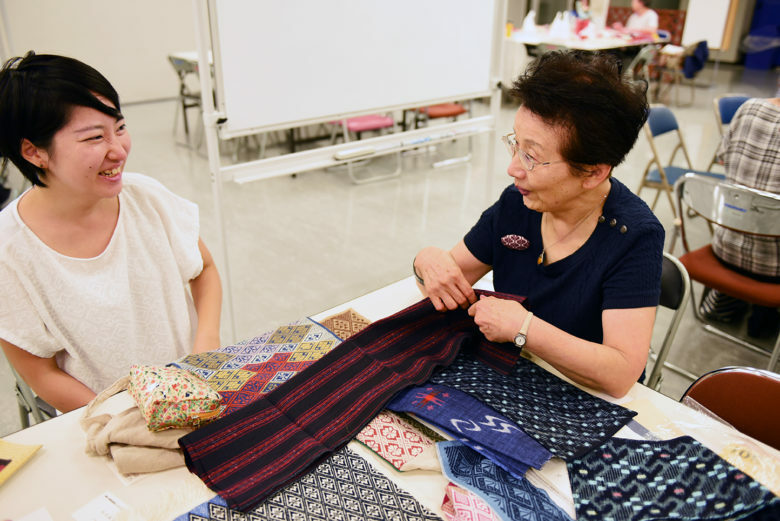 Ms Umesawa, who has learned both Koginzashi and Nanbu-hishizashi, said that the more she stiches, the more she feels that Nanbu-hishizashi is the embroidery for women. 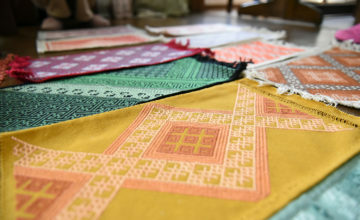 Perhaps, the more stitches are made, the more women are impressed by its distinctive characters, such as colourful threads, a horizontally long diamond pattern, and a round pattern within a frame. Compared to Koginzashi giving a sharp image by indigo blue colour and a vertically long diamond shape, Nanbu-hishizashi is more feminine. Maybe that is why Ms Umesawa feels so. 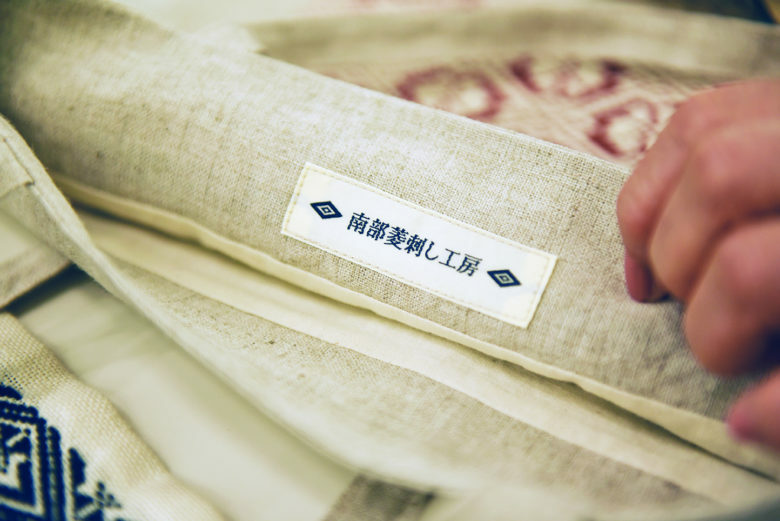 Nihon Vogue Corp launched “ Compilation of Hishizashi Pattern (reprint)” in spring of 2017, in which as many as 400 designs are exhibited. 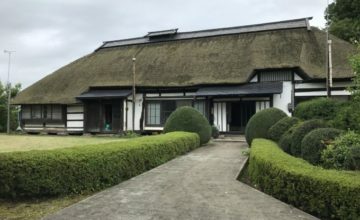 The devoted women, including Ms Nagaoka’s teacher, who fell in love with Nanbu-hishizashi, actualized this large and great compilation under the circumstance of less prominent activities for its preservation or inheritance and insufficient historical documents. I feel that the book can convey the devotees’ genuine toughness, which passionately and modestly handed down the charm of Nanbu-hishizashi in the male-dominated society. When I was thinking of it, I came across Ms Nagaoka. She is an inspirational woman who understands the women’s love and thoughts, and energetically commits to pass it down to the next generation. Junko Ladd (BA, MA) is a freelance Japanese to English translator (sometimes English to Japanese) and specializes in education and business including tourism and culture. In addition to her translation work, she keeps busy writing articles and teaching Japanese language at schools in England. She worked at the National Institute for Education Policy Research, universities and schools in Japan.